View All Fleetwood Axon Class A Motorhome Floorplans! 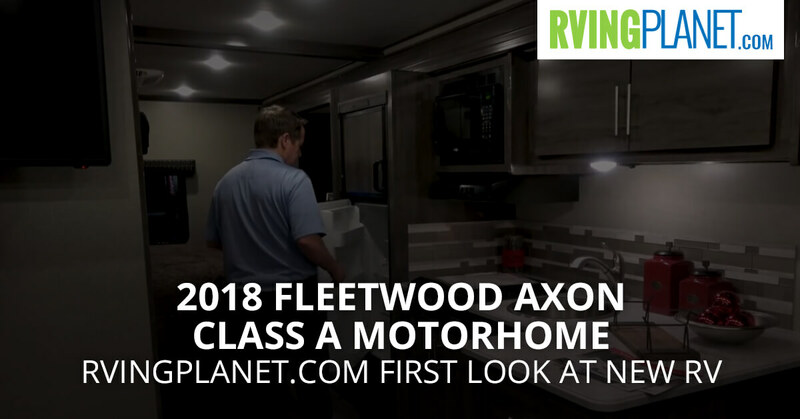 Nate: And we’re excited to show you the brand new Axon by Fleetwood Motorhomes. Keith: Hi, I’m Keith Packard with Rev RV. Nate: We’re looking at the Fleetwood Axon, and what makes this brand unique? Keith: Well, it’s brand new for Fleetwood RV along with Rev. This is designated just for those Millennials to be able to get to those people who want to do quick outdoor camping, want to do tailgating. As you can see there’s a great kitchen here, huge big screen TV on the outside. We do the easy go propane one of only a few manufacturers that do that. So when you run out of propane you just pop one out, run up to the convenience store, and get a six pack of your favorite frosty beverage come on back and fire up the barbie. Nate: So we’re looking like Millennials are they perfect person that are going to get the most out of this, right? Keith: Exactly, good storage for the zipline paraphernalia, the rock climbing paraphernalia. You’ve got plenty of towing capacity with this 7500 pounds, so bikes, motorcycles, ATVs, get out and play and take your house with you. Nate: Like Millennials that are looking at RVs just like the Axon where does it really stand out? Keith: Price, because again Millennials are not grandma and grandpa who are going to be buying four hundred thousand dollar RV. So this fits into a really good price point, 899, and it gives you everything you need. Basically it’s the price of a Cadillac Escalade with a bathroom. Nate: With these Millennials what do you think are the top three favorite features that they would enjoy most with the Axon? Keith: Oh, very simply – outdoor kitchen, it’s great. Most manufacturers are putting them in and it’s a really good option for us. Also the huge outside TV. It is great, when you’ve got the TV going, the awning out, shrimp on the barbie, cold frosty beverages, and probably on the inside the European decor and the look of it, it’s very cutting edge and it’s a good-looking piece. Nate: Thanks, Keith. Thanks for watching guys, and you can check out the Fleetwood Axon at rvingplanet.com.